Mónica R. Goya introduces us to this small but culturally rich part of northern Spain, listing the food and drink that’s made it famous for gastronomy. 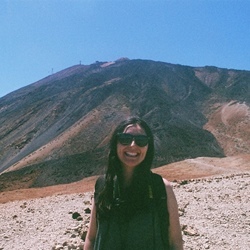 Mónica is a freelance journalist and photographer who specialises in travel, food and environmental work. 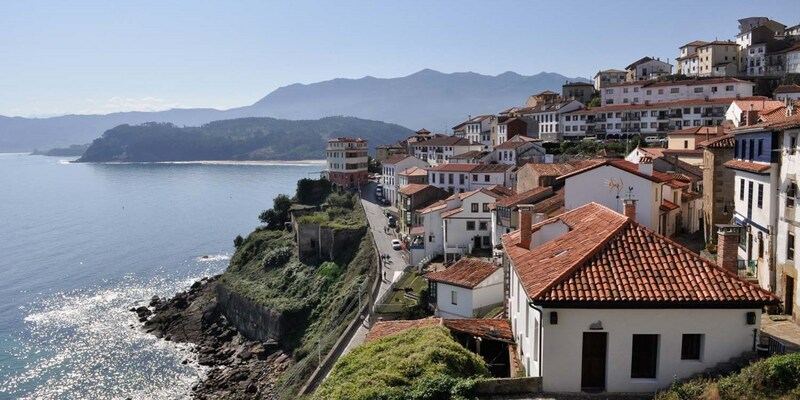 Nestled between the sea and the rugged mountains on the wild north coast of Spain, Asturias is a lush region located in a rich, fertile part of the country where finding world-class produce is easy. Celtic roots, an industrial heritage that includes coal-mining and steel-making, wild landscapes (Picos de Europa, the first National Park created in Spain, is partly located in Asturias) and a yet-to-be-discovered hearty food culture all come together to make this place a must-visit for food-lovers the world over. Once you arrive, these are the ingredients, dishes and drinks to look out for. If you could only try one thing from Asturias, it should be cheese. In fact, the region’s nickname is ‘land of cheeses’ and it is considered to be the home of the richest variety of artisan cheeses in Europe. 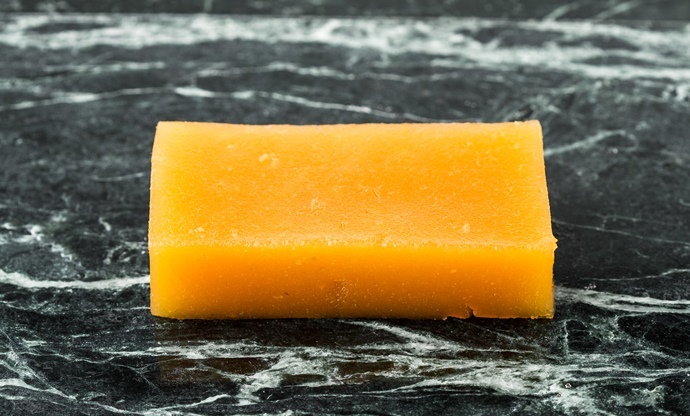 Given that cattle have been enjoying Asturias’ scenic green pastures for centuries, it comes as no surprise that cheesemaking is a craft deeply rooted in Asturian culture. Currently four Asturian cheeses have Protected Designation of Origin (PDO) status (Cabrales, Gamonéu, Casín and Afuega’l Pitu) and one has Protected Geographic Indication (PGI) status – Los Beyos. 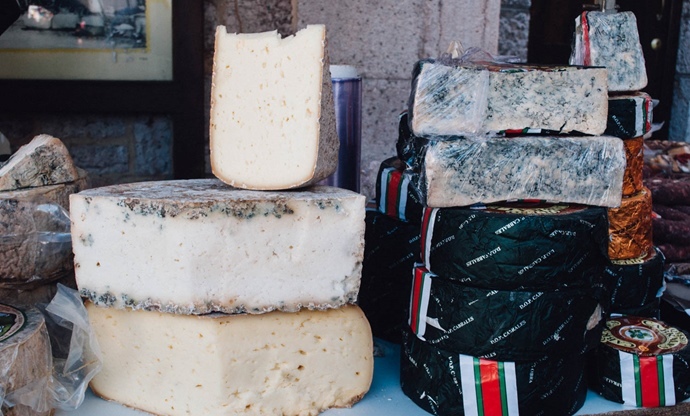 Out of these five, Cabrales is possibly Asturias’ most internationally renowned cheese. This blue cheese has a strong aroma, is aged in caves and is made from three types of milk (cow, sheep and goat). If you manage to find any Gamonéu del Puertu, produced in tiny quantities in the cabins of Picos, be sure to try it. Other interesting cheeses include Pría, Ovín, Vidiago, Rey Silo, La Peral, Taramundi and Varé. 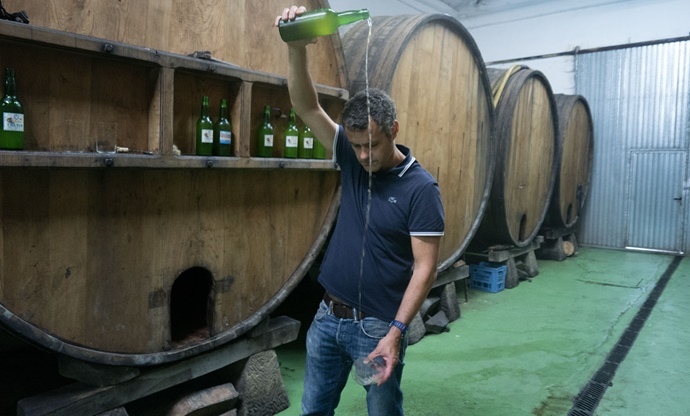 There are two things you need to remember before drinking natural cider (sidra) in Asturias. The first is that you always order a bottle of cider, never a glass, and the second is that natural cider is drunk in one go, as soon as it is poured for you. In Spain, natural cider is synonymous with Asturias as it is where over eighty percent of all Spanish cider is produced. The conviviality of Asturian people is best observed at sidrerías (cider houses). Relatively similar to the English pub, everyone is welcome at the sidrería, where natural cider is poured from above masterfully by the escanciador, a talented waiter who is able to perform the art with closed eyes. One hand holds the bottle up into the air, while the other holds the wide-mouthed, thin glass below the waist, into which only an inch or two of cider is poured. Called culín or culete, the small amount of cider should be drunk immediately as the method of pouring the liquid unlocks all of its aromas. You’ll also find cider used in the preparation of many meat and fish dishes. Possibly the most recognisable dish from Asturias is fabada. Simply put, it is a hearty bean stew cooked with pork meat. 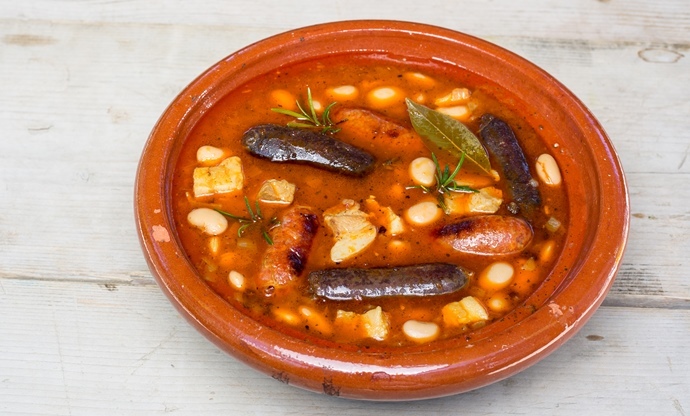 This dish is easy to find in restaurants across Spain – in many deli shops around the region you can even find vacuum-sealed packages with the main four ingredients needed to prepare it: white beans, blood sausage, chorizo and pork belly. Alternatively, there is also fabes con almejes (beans and clams), which is the seafood version of this dish, much lighter and equally delicious. If you wanted to cook it at home, you could visit one of the incredible farmers’ markets (Cangas de Onís on Sundays, or el Fontán, in the heart of Oviedo daily) and buy some Asturian beans (which are PGI-protected). These beans are the perfect match for these stews because of their buttery texture and soft skin. 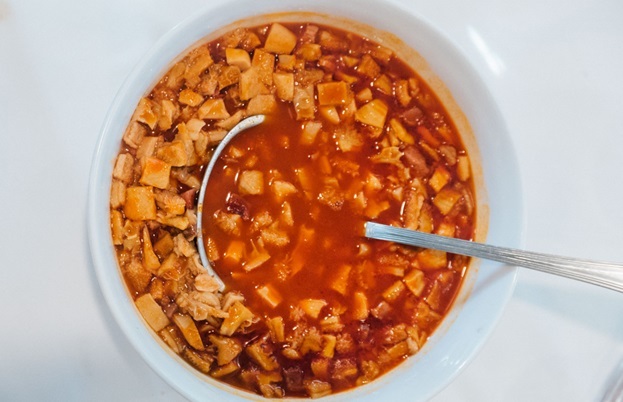 Pote asturiano is a staple of the winter diet in rural areas. It is fairly similar to fabada, but has its own distinct flavour due to the addition of cabbage and sometimes chestnuts. This Mexican cereal brought about a revolution in seventeenth-century Asturias. 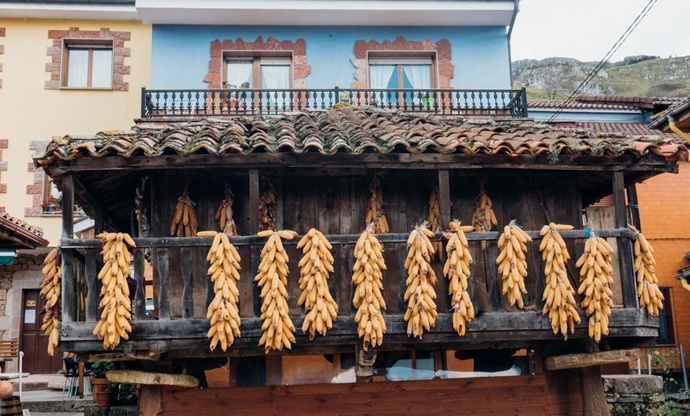 Introduced by the Spanish conquistadores, corn is a high-yielding crop, especially in comparison to the local rye or spelt, and therefore it was quickly incorporated to the Asturian diet. Tortos con picadillo, a corn fritter topped with picadillo (minced pork seasoned with plenty of paprika, which gives it its distinctive red colour) and fried eggs, could well be the answer to the full English breakfast. However, it was Michelin-starred chef Nacho Manzano who thrust this humble home-cooked dish into the limelight. Boroña bread is a local cornbread, and if available, it is worth trying the very filling boroña preñada, which sees the cornbread stuffed with pork shoulder and chorizo. 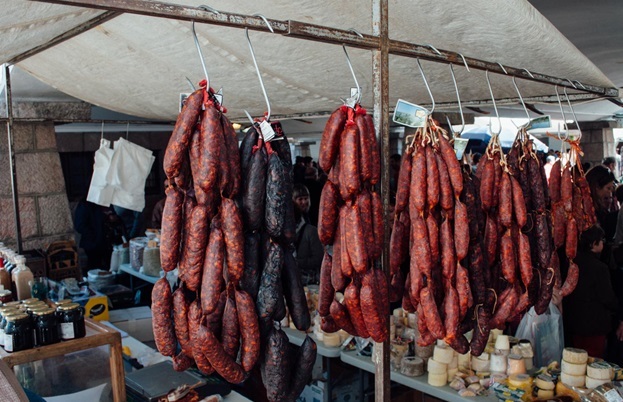 From exceptional cured meats to grilled steaks from grass-fed animals, if you eat meat, you will be spoilt for choice in Asturias. Pitu caleya (free-range chicken) is a delicious option, usually served with rice. Look for a sign that says parrilla (grill) if you’re after the best cuts of meat, from sirloins to ribs. Cordero a la estaca is another regional speciality. A roast whole lamb that’s slow-cooked over an oak or beech fire, this succulent, smoky dish is absolutely delicious. It’s worth considering trying the elusive Chosco de Tineo, a PGI-protected cured pork product originally from the county of Tineo that can be hard to find outside western Asturias. The description might not sound appealing (pork loin and tongue seasoned with garlic, salt and pimentón that’s wrapped in the animal’s intestine), but its juicy texture and smoked taste is delightful. Callos a la asturiana is another offal dish from the region. It’s made from beef tripe, which is cut into inch-long pieces and cooked with ham and trotters along with garlic, onions, white wine, olive oil and chilli. For a truly crowdpleasing dish, you can’t do better than the ubiquitous cachopo. Made from two thin beef steaks coated in breadcrumbs and filled with cheese and ham, this more modern dish has a cult following and is known for its mammoth size. 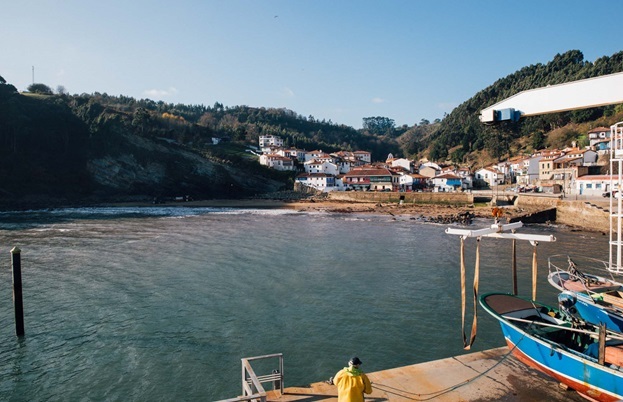 The Cantabrian Sea is an abundant source of fresh fish and seafood, supplying the coastal towns from the Basque Country to Galicia – and Asturias is no exception. In some fishing villages, like picturesque Tazones, most restaurants only serve fish. 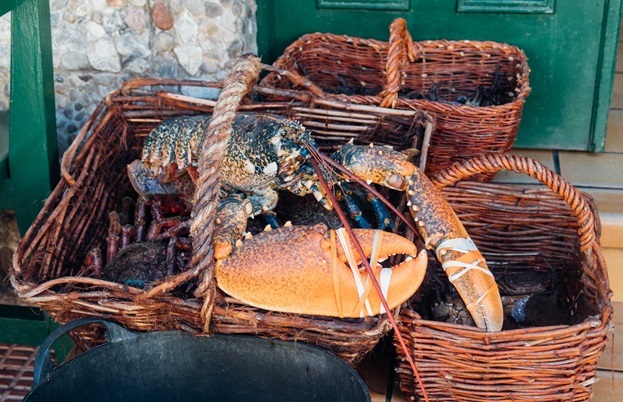 Baskets of lobsters, sea urchins or other fish in season are always on display in restaurants’ windows. Local fishermen adhere to sustainable fishing methods and the produce is often on the table only hours after it has been caught. Its freshness makes it world-class and the price is very reasonable considering its superb quality. Sea urchins that taste just like the sea, meaty fillets of Cantabrian tuna (utterly delicious when in season) or fish cooked in cider are all impeccable options. Cebollas rellenas (stuffed onions) are a local speciality from one of the coal-mining counties of the region. They are served stuffed with tuna and vegetables. Squirrels are in their element around the Asturian forests as walnuts, acorns, chestnuts and hazelnuts are a common sight. Many of the region’s desserts are nut-based, like casadielles, a long, thin layer of pastry filled with a paste of walnuts, sugar and anisette (an anise-flavoured liqueur). Chestnut and hazelnut cakes are a real treat in the autumn months and they appear in different guises, often with chocolate. Asturcilla, a locally made hazelnut and chocolate spread, is becoming increasingly popular and available across Asturias, and one of the best sweet souvenirs you can bring back home. In rural areas especially, roast chestnuts make for a hearty end to any meal. Requesón and honey is an old-fashioned but classic dessert usually found in the western counties of the region. Requesón is usually made from whey in similar way to ricotta. 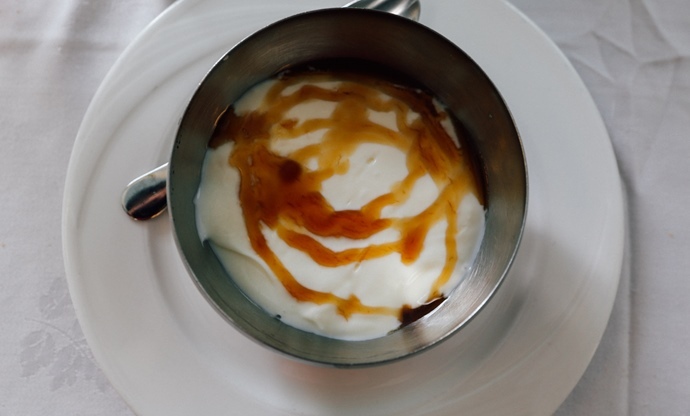 The result is a fresh, spreadable cheese with a creamy texture, often mixed with milk or whipped cream before serving. The delicate local honey drizzled over the top provides a perfect contrasting sweetness. In a society deeply connected to the rhythms of nature, Asturian fruits are always enjoyed when in season. From the delicate summery berries (especially blueberries) and small peaches and plums to pears, dozens of apple varieties, quinces and citrus fruit from the coast, the region boasts a generous bounty. Membrillo (quince) or apple paste are both delicious, especially topping a slice of good country bread with one of the many incredible Asturian artisan cheeses. Other classic options include cheesecake topped with berry compote and apple cakes.